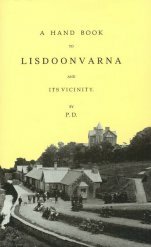 A Handbook to Lisdoonvarna and its Vicinity by P. D.
GIVING A DETAILED ACCOUNT OF ITS CURATIVE WATERS AND TOURS TO THE PRINCIPAL PLACES OF INTEREST IN THE COUNTY CLARE. P. D.
CLASP Press is delighted to make available once again this fascinating Handbook to Lisdoonvarna and its Vicinity. Its first appearance in 1876 coincided with a period of great growth at the celebrated Spas of Lisdoonvarna. The Galway Steam Company landed daily at Ballyvaughan and the midland Great Western Railway advertised Lisdoonvarna as a prime destination in its Summer Excursions. Unquestionably, the author knew the area and its people from Liscannor to Oughtmama and the Blackhead to Kilnaboy. The introduction was written by the late Cyril Ó Céirín, author and poet, who could trace his ancestors in Lisdoonvarna back to the 1700's. This introduction also includes an outline history of Lisdoonvarna Spa up to the present day.